The PIUS-GS Series for general playing includes 1 PIUS1, 2 PIUS3, and 1 PIUS4. It's very special experience for using these mallets, Pius Cheung series is a great choice for many different type of music. For me I personally play with rattan, the bass is deeply warm and hard mallets(from yellow to white) are very penetrate, specially good for not only solo but ensemble as well; orange is basic choice as medium hardness, furthermore, if you combine with different models at the same time each one just like 4-part voicing of different instruments creating profound and various sound. Strongly recommend! This set of mallets create a nice, soft, and warm sound. They are somewhat front heavy, and the rattan takes time getting use to for Steven's grip users. Caution: store mallets very safely or in plastic mallet to keep from fraying faster, they fray really fast. 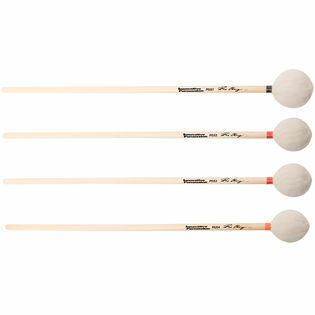 I like this set of graduated mallets. The Rattan handles might need some adjusting to if you are playing Steven's grip. I've let others in my studio play with them and they've each commented on the increased weight of the mallet heads compared to other mallets although I haven't really noticed this. These are still great to have and they produce great sounds on marimba!